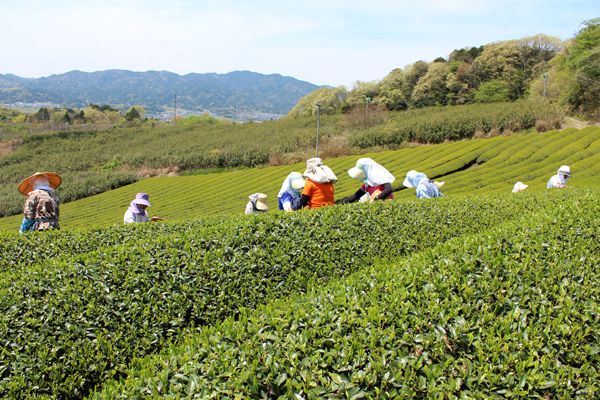 In the Tsuchiyama tea region in Shiga Prefecture, the first picking of first-grade tea begins after the cherry blossoms fall at the end of April. Our supplier of tea allowed us to visit their farm and photograph the picking of tea by hand. Nowadays, because tea-picking is typically done by machine, the amount of tea picked by hand is only a few and is partly considered as a luxury item. It is also used to celebrate the beginning of a new tea season and carries the nuance of ritual and festivity. When I visited, a number of women wearing traditional clothing were carefully picking young, supple sprouts. It was a task that required perseverance, and tea-picking was conducted carefully and speedily so as not to harm the tea plants. Tsuchiyama is surrounded by mountains in every direction, and the area is often covered in frost. The cool air lowers the temperature in the tea farm so temperature control is conducted by sensors; and the temperature is adjusted by fans and sheets covering the plants to prevent cold-weather damage and to safeguard the growth of the plants. As much as possible, this farm does not use fertilizers or pesticides. 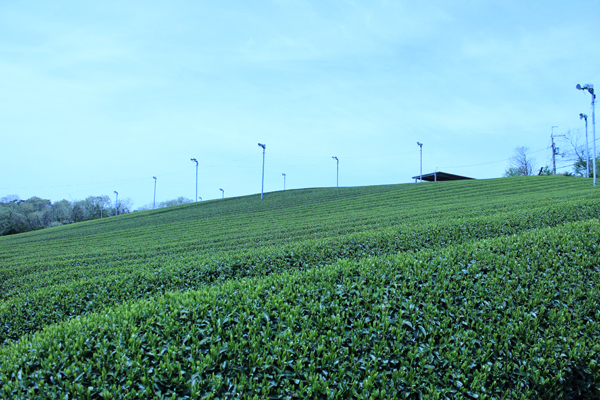 They are kept to a minimum; and the farm is particular in creating an environment that is conducive to the genesis of the original, real taste of tea. 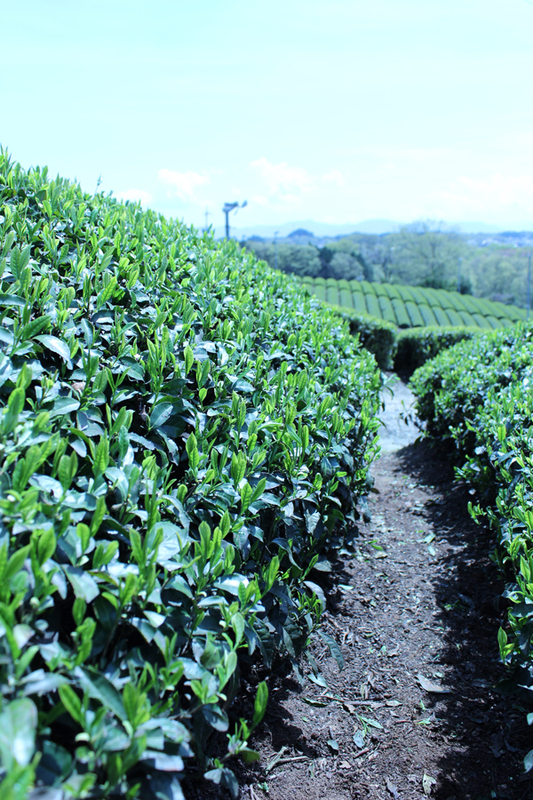 The age of the plants in the farm that I visited was about 30 years old; and while more rain than usual fell during the spring of 2015, they’ve been blessed with good weather since and they say that their new tea leaves are growing well. 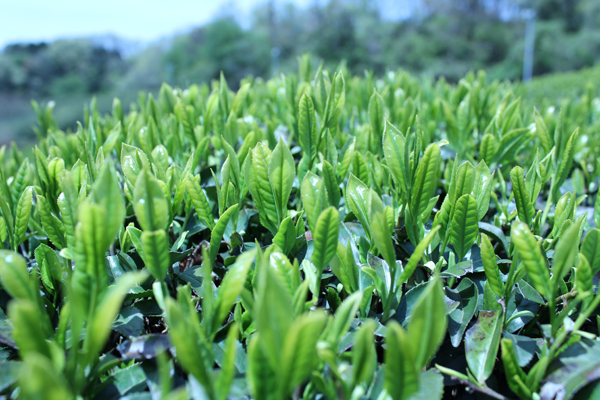 The 2015 crop of new tea is slated to begin selling at tablinstore in the middle of June. Please contact us for details.